I have a thing for salads. Most of the time, I’m throwing a plethora of fresh vegetables into a big bowl, topping it with some hummus and balsamic vinegar and calling it a fantastic meal. But there are times when I take a more strategic route and put together a solid recipe that is definitely worth sharing. Most people think of salad as filler and have a hard time accepting it alone as a meal. I’ve gotten really good at changing the way people think of salads by proving that a nutrients and satiety can all be achieved. Quinoa is one of my favorite salad secrets. This ancient powerhouse grain is filled with protein and fiber and is a nice alternative to any pasta. It’s easy to digest, gluten free and has a deliciously nutty flavor. The texture is outstanding in almost any salad dish. 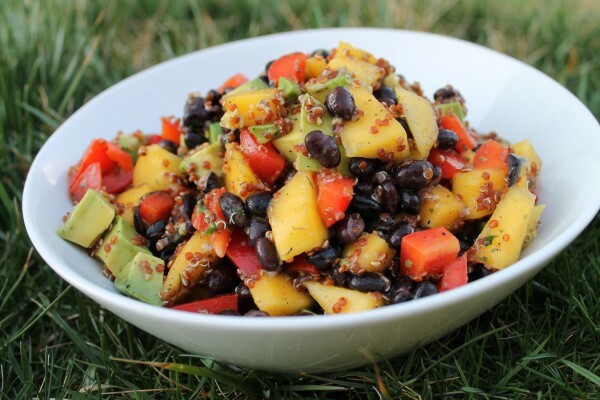 I’ve created quite a few quinoa salad recipes, but this one is by far my favorite. You can eat this on its own or serve it with a bit more protein for an even more satisfying meal. Mix to combine and serve.